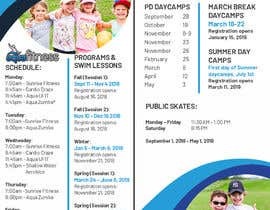 The Bell Aliant Centre is a community rink and pool that offers programming for all ages. We are looking to wrap a pair of our doors with schedule information for the year. Attached is the schedule we would like to display with a few images that could be used for the background. 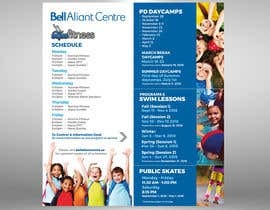 The Bell Aliant Centre logo should feature prominently, as well at the bottom there should be an arrow pointing to the right that directs people to the Control & Information Desk for more information on any program or service; there should also be a note that says: *Schedules subject to change. Please visit [login to view URL] for updated copies of all schedules. Each door is 83" tall x 37"; there are two doors so the total width is 74" wide x 83" tall.